Question: Do you enjoy novels or anthologies more? Why? A little more than half of us prefer novels to anthologies. We like to be truly transported for hours. We like to get to know memorable characters deeply. We love to immerse ourselves in a good author’s fully-realized vision. This does not mean that we are evenly split between preferring anthologies and preferring novels. Only around a sixth of us prefer anthologies. Some of us love the intense sharp shock of a good short horror story. We like to discover new writers and new subgenres via anthologies. But far more of us are annoyed by how uneven many anthologies are. Ellen Datlow and Terri Windling can only edit so many anthologies for mainstream publishers in a given year and we tend to worry that the small press is less dependable for quality. Approximately a third of us could always go either way and enjoy both novels and anthologies in equal measure. Sometimes the deciding factor is where our lifestyle is at for a given moment. While raising children or on a book tour, it just may be more feasible to read a short story uninterrupted in its entirety than a novel. And, of course, some of us had to color outside the lines. Some of us prefer something in between a love the size of the story which can be told in novellas and short novels. Some of us prefer short stories, but only when presented as a collection from a dependably excellent writer such as Stephen King or George R. R. Martin, as opposed to an anthology of potentially varying caliber. From a professional standpoint, many of us find anthology income dependable, but novels surely do pay more. When it comes to horror, I tend to favor short stories and therefore anthologies. But only by small bit – a photo finish, to fall back on sports clichés. I think that’s because the purpose of a horror story is to create terror, to unsettle you, to creep you out. Short stories have the sweet spot in that regard. They can be consumed in one sitting. I’m not forced to put the book down and break the spell the way I am with a novel. Either/or. I often prefer the compactness of horror in the short form, as the emotional punch tends to be most effective when delivered that way. Yet, more often than not, I find myself sitting down with a novel because it allows for richer character development. If a horror novel is poor, however, it’s that much more frustrating to have invested the time and energy. Bad horror is just about the worst thing in the universe, except maybe a black widow spider going down your shirt. I love short fiction, and I tend to think horror almost works best that way – the short, sharp shock. Anthologies. I love the short sharp shock. It is so difficult to sustain horror over the length of the novel credibly. Only the finest writers can do that. I prefer “entertaining” and “intelligent”. I don’t care who gets me there. Novels, so far. I like to be able to submerge myself in a book’s story, at least for a little while. With shorter stories you can’t quite do that, or at least not for long enough. Not to say short stories aren’t as good as novels, I just would prefer reading them. Anthologies are good for providing an introduction to authors we may not read otherwise, but I prefer novels. They just provide the chance to allow us to care about the characters that we ultimately wind up torturing. Anthologies. I have less and less free time nowadays, so it takes me forever to get through a novel. But I can usually squeeze in a short story or two in the morning, or before bedtime, so I always have a stack of anthologies waiting to be read. I’m currently reading an old Alfred Hitchcock anthology that I snagged on Ebay. I’m a short novel fan myself. Whoever came up with the bright idea that 350-400 pages was the optimum length wasn’t taking me into account. Too often, these standard length novels are bloated just to make the publisher’s favorite page count so it looks pretty on the shelf. I’m hoping with the ebook revolution we’ll see more novellas and short novels standing out from the pack–and being paid as well as the longer stuff. It really should be about the quality of the story experience and not the quantity of pages, shouldn’t it? I tend to cherrypick my way through anthologies based on writers I like and what stories are getting good reviews. I think the only anthologies I’ve read cover to cover in the past couple years have been DARK FAITH and Joe Hill’s 20th CENTURY GHOSTS. It depends on the time in my life. When the boys were babies there was no way I’d ever get through a whole book and anthos saved me. I’m getting a smidge more time (and was given a Kindle) so I’m getting back to books, finally. I don’t read a lot of anthologies because I look at them as primers on new genres. I read one to see if I like this sort of thing, and if I do I move on to long form. I read more novels, since with a single-author work the reader can be sure of what she’s getting. I do enjoy a well-constructed theme anthology, though. As far as non-theme anthologies are concerned, I regularly read the volumes edited by Ellen Datlow and Terry Windling. For theme anthologies, I tend to buy quirky books such as WOLFSBANE AND MISTLETOE (werewolves and Christmas), etc., edited by Charlaine Harris, and Esther Friesner’s recent FANGS FOR THE MAMMARIES. I’m sorry to say that I’m not much of a short story writer or reader. I’ll buy an anthology if a friend is in it, read his or her story and maybe a couple others, and then put it aside. I like to lose myself in a novel for a long period of time, both in writing them and reading them. I like novels, anthologies, and collections, all for different reasons, same as beer, wine, and whisky. Or tea, coffee, and fruit juice. Both – short stories and novellas can sometimes offer startling perspectives and ideas; novels sort of carry you along deeper into the author’s vision. Generally I prefer the depth of a compelling novel but a good short story can have a lasting impact. Novels, absolutely. I’m not a big short story reader at all. I’d rather read 100 pages of a novel and not finish than read a short story. Definitely novels. I like to feel a whole emotional, narrative arc over the course of a few hours. I tend to prefer shorter novels for this reason. Too many 500-page books, in my view, have 100-page plots. Forty years ago, they never would have been published without a huge giant gaping cuts in their rambling discursions. Word processors have made bastards of us all. I enjoy short stories because I get less attached to the viewpoint characters. Particularly in the darker genres, this tends to make me prefer anthologies because I am okay with terrible things happening to characters I’ve only invested reading (or writing) a dozen pages about. I also enjoy anthologies in general as a way to discover new writers I enjoy. I enjoy a good story – in whatever form it is delivered. It depends on my mood. Horror frequently works better in shorter forms, but I find myself reading novels more often. I enjoy novels more. I never seem to get to all the stories in an anthology. I probably read more novels because there aren’t that many anthologies being published by the mainstream press, and some of the ones coming out of the small press are uneven at best. I enjoy a good anthology, savoring the different flavors from each author, and I like writing for anthologies, trying to come up with a new spin on the book’s theme. So, equal enjoyment but I read more novels. I prefer novels more because it provides the opportunity to sink more into the world and characters created. I’m actually a big fan of things like Stephen King’s short story collection “Night Shift” and I like short stories a lot….William F. Nolan has some particularly good ones. I do not “prefer” novels. I like good well-written anything. Generally I prefer novels. I prefer to immerse myself in a story. However, I do like Stephen King’s and George R R Martin’s short stories. I’m a novel guy, I prefer good character development that sometimes can be lost in short form. Maybe it’s from growing up reading Stephen King books where the first 200 pages are just learning about the characters. Novels for the most part, though I do enjoy short story collections by single authors as well. I lean towards novels, most anthologies disappoint. It is difficult to gather that many short stories from that many authors and weave them together seamlessly. I like novels best and find them more satisfying as I think that once I get into an anthology, I need a longer read, giving me the opportunity to understand the characters in depth. However, a well-crafted anthology is good for a taste of several writers’work and I admire chort characterisations.. I like novels way more than short stories. Especially when the book is a good one. If the book is good I don’t want it to end, the bigger the better. I enjoy getting to know the character, and I love it when the plot gets nice and complicated. Anthologies. You can get in and out of a short story relatively easily, but sometimes it’s hard to get back into a novel if you have put it aside for a few days to do something else. Novels, although my work appears in anthologies. Novels. I like the depth of character development often missing in short stories. Neither. I enjoy short stories and novels. Again, I enjoy anything well-written whether it’s an anthology or novel. I also enjoy collections by great authors. I rarely read anthologies; I like to write for them if they’re not specialized. I read novels, but mostly historical fiction…I write fresher horror if I get fresh impressions from outside the genre. Both, but I tend to get stolen away by novels only because their designed that way. I can easily sit down and pace myself with a short story collection. Joe R. Lansdale? Y’all have got my heart when it comes to anthologies, bud. I edit anthologies, so I’m going to recuse myself on this one. I like to be immersed in an author’s world. These days, I find most short stories are too short to develop much character or scenery or to step very far beyond the mundane and familiar. I think that’s a factor of the shorter lengths most editors request now, so that they can sandwich more stories into a book. With a novel, the author has time to spread out, be imaginative, and pull me in. Novels. I like the expansion that comes with a full length work. Usually novels, but I have read some great anthologies too. With anthologies, though, it can be hit or miss, all depending on the authors involved and the level of production the publisher puts in. Anthologies, for the most part. I can always find at least one good story that carries me on, but not so with a novel. Novels have to be really, really well done. I enjoy both, it really just depends what mood I’m in at the time as to which I’ll pick up first. I do like the fact that a short story can be read in one go, handy when you’re travelling or very short of time – but I read fast, so novels don’t tend to take me too long either. With anthologies such as the one I co-edited with Paul in 2009, Hellbound Hearts, there’s also the pleasure of a wide range of stories within one book. A new novel from a favorite author is always exciting, but anthologies give you a lot to sample on a theme… Since I have been submitting to a lot of antholoies, I have been looking at those more, lately… And my first forays into more grown-up SF were anthologies in my Dad’s library, usually edited by Judith Merrill or Groff Conklin. I’d rather read a whole novel. When I was younger and less patient I preferred anthologies. Short stories don’t allow the space to develop characters, so they don’t offer a range of emotions. Again, by definition a short story produces a single emotional effect, and even in an anthology its’ usually the same effect over and over. Anthologies are just plain more fun to me. It is like ordering a bunch of different appetizers at a restaurant. I’m fond of the old Derleth anthologies. Pulp anthologies. I prefer short stories to novels, though I don’t necessarily enjoy anthologies more than novels. I love both, but find myself buying more anthologies. I love short fiction immensely. It’s a difficult art form to master, and when done right, it satisfies in ways the long form never can. Both. Crime and thriller novels I read most of all but supernatural anthologies are great as well. I enjoy both novels and anthologies in equal measure. If the work is good, it doesn’t matter what length it is. I like both. Novels are the long haul and fun to read over days. But sometimes I just want short bursts and there’s nothing quite like a good short story. It’s a work of art to be able to capture a story in a brief space. I tend to enjoy novels more. I’ve read some wonderful anthologies in my time, many of them edited by the superlative Ellen Datlow, but when that moment comes when I’m faced with the decision of what to read next, nine times out of ten I’ll choose a novel instead of an anthology or a single-author collection. I think I just prefer staying with one story over a long period of time so I can really live inside it. Novels are immersive experiences, a full sit-down dinner compared to an anthology’s selection of hors d’oeuvres, and I guess right now I’m more of a sit-down dinner kind of guy. Of course, this might just be a passing phase. There was a time when all I read were collections and anthologies. There is something wonderful about being scared in five thousand words or less. It requires a great skill. But, then again, a novel that gradually draws you in and then delivers with a bang is also fantastic. If i want a quick thrill i grab an anthology- if i am looking to lose a few hourts I grab a novel. It very much depends on the circumstances when I’m reading them. If I’m taking some time off I like to get stuck into a novel because I’ll have longer to read it, but if I’m travelling – say a couple of hours on a train down to London – then short stories in an anthology work better. I do like the ‘dipping into’ aspect of anthologies, and the fact you get lots of different styles of writing in one book, each story being different to the next. That’s the most appealing thing to me about editing anthologies as well. When my wife – horror author Marie O’Regan – and I edited Hellbound Hearts it was a joy to see what different writers had done with the mythology Clive Barker set up in his original novella. Novels. But if I have less time to read, short stories do it better for me. A novel takes you away for a long, long time. A short story does well for an hour. I enjoy them both equally. Reading a novel is obviously a more focused endeavor, while anthologies give you a bit of a break between stories and at the same time treats you to different takes and styles on similar material by different writers. Having edited several anthologies, I can tell you that seeing those differences between the various authors is half the fun! Novels, for both reading and writing. I find the journey more satisfying. I like novels best, getting deep into the characters and the situation. I enjoy short stories, but I’m more inclined to pick up novels. Novels, for the sole reason that you can dig your teeth into them, whereas, with stories, even the best can be forgotten, if you’re reading one after the next. Novels. I like a full story. I like to get into the characters and stay with them. 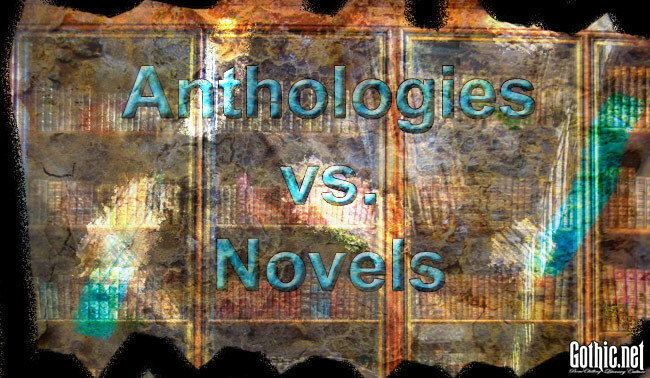 Anthologies are short stories which means they more often rely on tricks or tools of storytelling and characters are secondary. Shirley Jackson knows characters in a short story, but often it’s a point the author felt like making, or a guaranteed five-cents-a-word that was available. I love Steve Rasnic Tem, Jack Ketchum, other short-story masters, but a good novel… so satisfying! I prefer novels because if it’s a good novel, you get immersed in the story and start to care for the characters as though they’re real people. Novels because the storylines are longer and richer with plenty of room for interesting subplots. You also have more time to get to know the characters. I enjoy novels more, but I tend to read many anothologies because I can bite off a story at a time and set it aside. I love to write notes in the margins so I’ll remember if I’ve read the story already. This is especially helpful when I’m on the road on book tour a lot and have to read in fits and starts. Novels. I want to be drawn into a long, complex story. Really, I enjoy them equally. But lately I’ve read more novels than anthologies. I buy both. I’m not as religious about reading every single story in an anthology, though I used to be. I think I prefer novels right now only because there’s more space to make the story “fuller.” My preference may shift at any time.